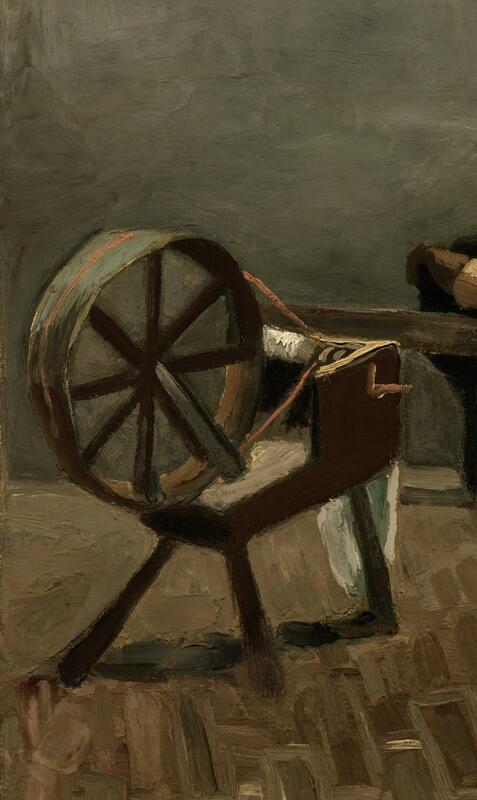 Van Gogh’s feeling for the working poor is evident from his earliest works. In 1883-84, he executed at least twenty-eight oil paintings, drawings, and watercolors of the weavers in the district near his family’s home in the Netherlands. His interest was aroused not only by the subject, but by the somber effect of the dark wood and gray walls, contrasting with the red cloth on the loom. In a letter of about April 1, 1884, when this painting was still in progress, Vincent wrote to his brother Theo of "studies which are your property, which I will send you if you like, but if you don't care to have them, I will ask you if I may keep them sometime, as I need them for my work. 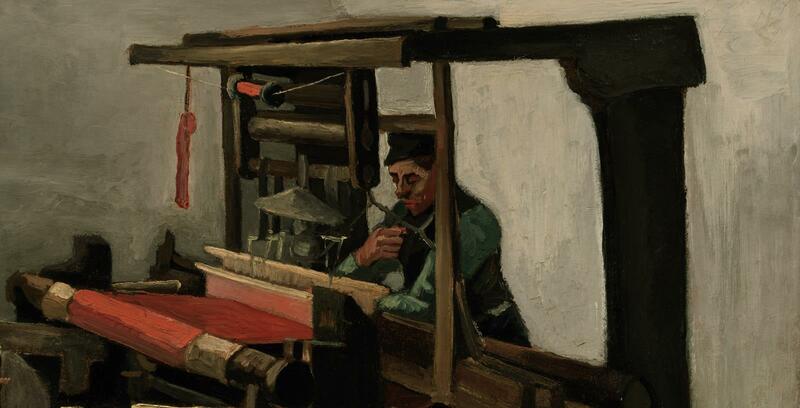 The one is a large weaver, who weaves a piece of red cloth...." About a month later (about May 1, 1884), Vincent mentioned the painting as still being in his care. See J.-B. de la Faille, "The Works of Vincent van Gogh: His Paintings and Drawings" (Amsterdam, 1970), cat. no. F29 (letters no. 364 and 367). 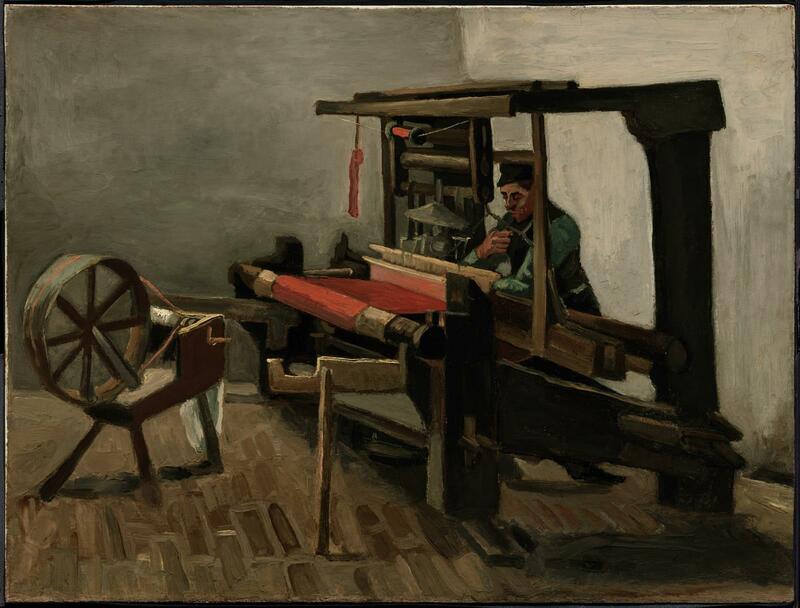 Martha Op de Coul, "In Search of Van Gogh's Nuenen Studio," Van Gogh Museum Journal, 2002, p. 115, has identified the MFA painting with the Weaver exhibited at Oldenzeel from November 1 to December 13, 1903 (no. 12). This was evidently part of a group of works that Van Gogh had left in Nuenen, which were later packed and deposited with Adrianus Schrauwen, who then sold them. When they came into the possession of Kees Mouwen, they may have been owned jointly with Willem van Bakel (b. 1866); see pp. 107-109. The information about the Dekker family is taken from De la Faille, 1970 (as above, n. 1). In earlier editions of De la Faille's catalogue, Nelly Dekker is given as the earliest owner, and Mrs. C. Dekker-Fortanier is listed second. The dealer Houthakker wrote to MFA director Perry T. Rathbone (March 26, 1958) that the painting came "from the collection of Nelly Dekker, The Hague, and her heirs." In a subsequent letter (June 7, 1958), Houthakker mentioned other objects from the Dekker collection that he was selling.